Get out of the boardroom and onto the paddleboard! 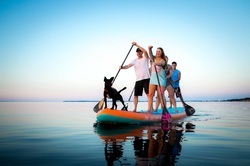 Is a Stand-Up Paddle outing Good for your Group or Corporate Team?? Enjoy active participation and hands-on activities. Enjoy getting outside and moving together. Want to improve team performance and camaraderie. Are looking for unique team building activities for conferences or corporate retreats. How many people should you get together for your group outing? The Stand-Up Paddleboard outing can be a unique team building experience or a fantastic day of “fun building” on the water! We welcome groups as small as 4 people and as large as 16 currently. For groups up to 8 people - We will take out your group of up to 8 Colleagues, co‐workers, friends, family, church group, etc. on our Yolo Grande 6 man inflatable board after a brief off-water brief instructional and safety review. For groups of 9 or more - We will take out your group of over 8 Colleagues, co‐workers, friends, family, church group, etc. on individual stand-up paddleboards after a brief off-water brief instructional and safety review. All events include stand-up paddleboard gear and good times. Pictures available upon request, as well as specialized food and drink packages at local waterfront location available as an add-on! ​Please contact us for more details, or to customize your corporate outing experience. Why go on a Stand-Up Paddle outing? Learn a New Sport together as a team and go home with a love for paddleboarding that can be carried on individually as well! Participate in a positive excursion enjoying our lovely Lake Norman. Help introduce this new healthy and Green activity of Paddle Boards to your staff/members. Get a sneaky, fun workout while working on your team-building, communication, leadership and many more skills! to Book Your Outing Today! This website, including all proprietary information and other materials provided on or through the website, including any data, text, designs, graphics, images, photographs, illustrations, audio and video clips, logos, icons and links are owned and operated by My Aloha Paddle Sports and Fitness, and are protected by copyright/trademark and other applicable laws. All other marks, logos, pictures or names appearing on the website are trademarks of their respective owners. All rights reserved, My Aloha paddle sports and Fitness.